Last week was my last week at the Co-op. Last week I had to finish handing everything over to those who would carry on my role, which made it pretty busy. Last week I had to say goodbye to a number of really good friends and a whole load of great people I'd spent the last 3 years working with. The day itself came far too quickly and I inevitably I soon found myself being surrounded by friends and colleagues for the traditional leaving presentation. I received the speech and my presents and I think I managed to give my little goodbye speech without too much emotion creeping in. As I said in the speech, I began the process of leaving the Co-op nearly 10 months ago. It was at a time when I was being put into a role that I was neither too familiar with nor one that I wanted to move into as a career choice. Since then I've had a number of interviews with Lloyds and I like what I've seen and heard. The role they offered suited me much better. During those 10 months however I have learned the Co-op role, become part of a very large programme and more importantly, built a number of very strong friendships. As I said in my speech on Thursday, if I was asked at this point in time, I wouldn't even be considering leaving the Co-op. I couple of extra years on the programme doing a role that wasn't my first choice would have been fine. But, I have completed the process with Lloyds, and I do like the look of the role they've offered, so there really is no turning back. Having organised a leaving present or two myself in the past, I know how tough they are to keep on top of. At the Co-op we are spread across three buildings in Manchester, which makes it all the more difficult. I'd like to thank Claire for all her hard work last week, taking on a number of my tasks, making sure I handed over everything in time and on top of this and her own work, for sorting out my leaving present. 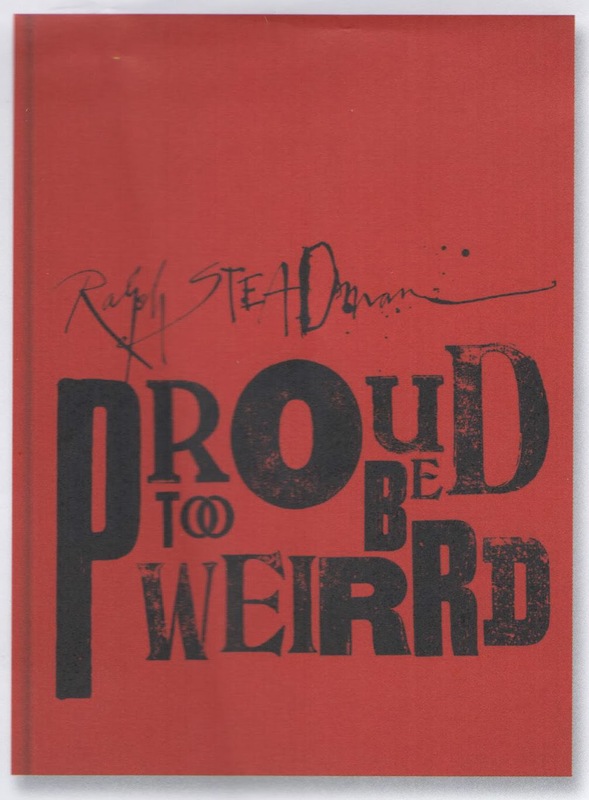 The very generous collection bought me a copy of Ralph Steadman's latest book (and a very big book it is) Proud Too Be Weirrd. It's something that I will treasure forever. There was also a little box of things that'll help me survive in my new company. The vital stuff. Biscuits. Earl Grey Tea and an emergency light and whistle. And of course the cards with some lovely comments, an some cheeky ones of course. I had decided to have my actual Leaving Do the next day, on the Friday night, taking the day off to collect my hire car (a lovely white it is too ... well .. it was) and going into Manchester later in the day to meet up with those who could make it out that night to make sure I didn't have to drink alone. Again the event, which was in the Terrace bar in the Northern Quarter was organised by Claire and was a great night that went off without a hitch, apart from me being a little late... sigh. It was really nice that so many managed to come along, some even by way of Barclays (they had left the Co-op a number of months ago). 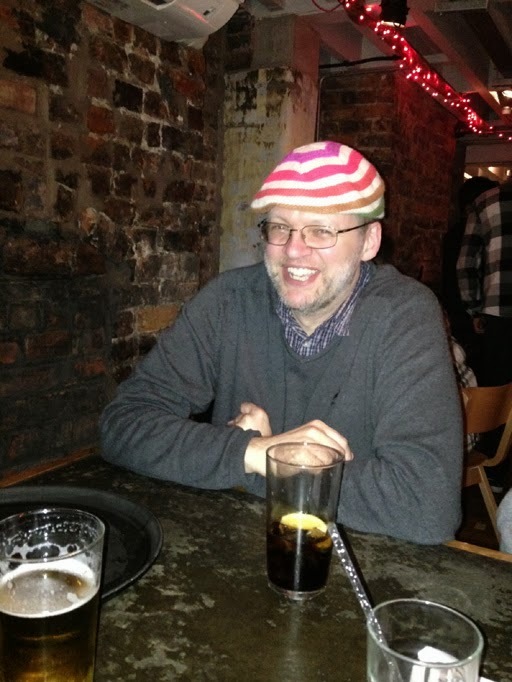 I had a lovely evening chatting to people who I really do hope, and plan, to keep in touch with. 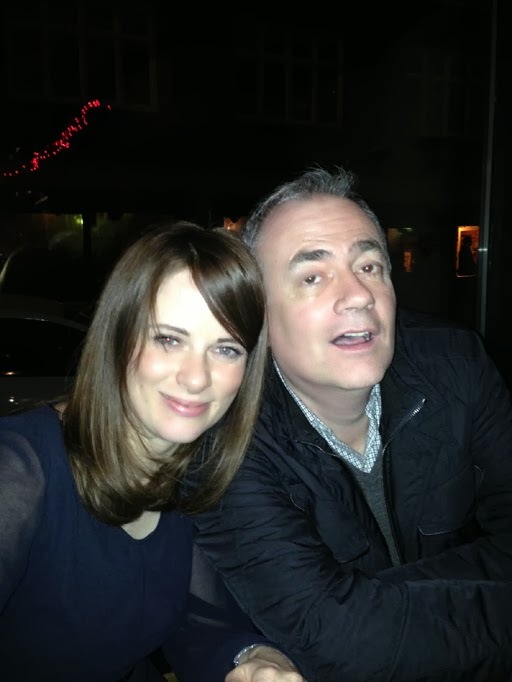 Claire and Neil - pose for the camera. 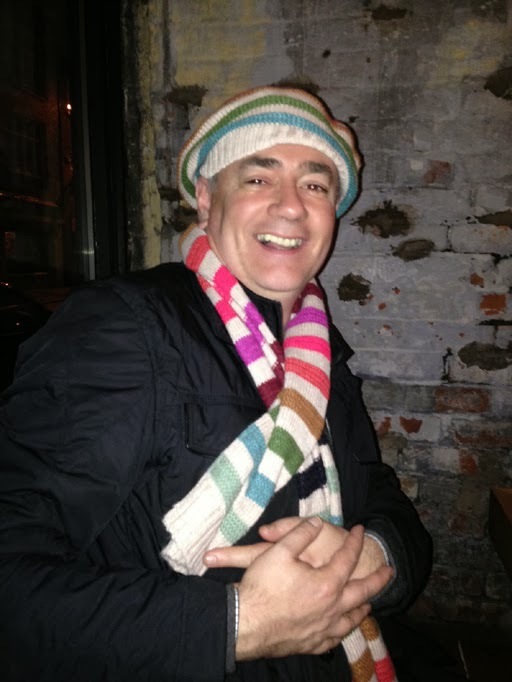 Neil goes one better and poses in Claire's hat and scarf. As people left one after another the whole thing became more and more real for me, the beer helped to keep me from getting too sad. At the end Matt, Neil, Claire and I were the only ones left. 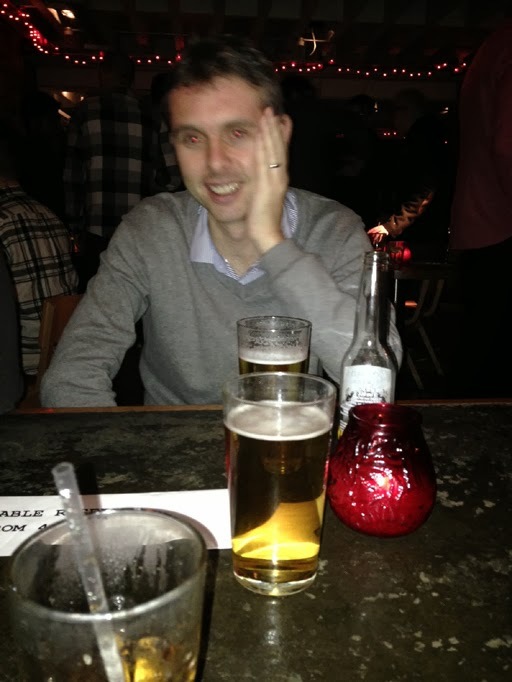 We stayed for another couple of pints. I confessed to Matt that the only way I'd managed to beat him in the Team Fantasy Football League the year before was by getting another friend of mine (an old Barclays friend who Matt would never meet (for his safety)) to manage the team for me. I've always been a believer in accepting your own limitations and finding creative ways around them. Matt was a little annoyed, but mostly relieved to know that he wasn't beaten by a Sci-Fi geek. Matt just couldn't believe I had been so devious. And then I found myself making sure Claire got her taxi home safely and a slow lonely walk back to my hotel (I decided a few weeks ago that I wouldn't be getting a train home after drinking as much as I knew I would be drinking). Thanks then to everyone at the Co-op who made the last three years so enjoyable, and particularly those on the Jupiter Programme for bearing with me as I got my head around the Lead Solution Architect role. I'll miss you all. I'll leave this posting with the best role title I had in my time at the Co-op. At one point, on the Mars programme, I was Dave West, Data Architect of Mars ... look out John Carter. The Vanity Of Small Differences and other stuff. As I come to the end of my time working in IT at the Co-op, I find I've a few days holiday to use up. 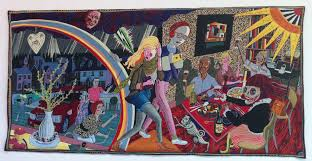 I decided to pop into Manchester City Gallery on one of these days to take the opportunity to see Grayson Perry's 'The Vanity Of Small Differences' tapestries. We had watched the Channel 4 program a year or so ago and watched the recordings again last week before we went. Based on Hogarth's A Rake's Progress the six tapestries follow the life of Tim (as opposed to Hogarth's Tom) Rakewell in his rags to riches story as he climbs from the working class, passes through the middle class and ends (in all senses of the word) in the upper class. We really enjoyed the TV programs, with Grayson coming across as a very genuine bloke who had respect for all classes and really wasn't there to judge. The most harrowing class for me was the upper class, where my preconceptions were completely trashed by a very sensitive insight into their existence, being tied to tradition and an obligation to preserve the past, regardless of personal cost (in terms of both money and living). Seeing the tapestries in person, their scale, artistry and vibrant (but appropriate) colours was stunning. 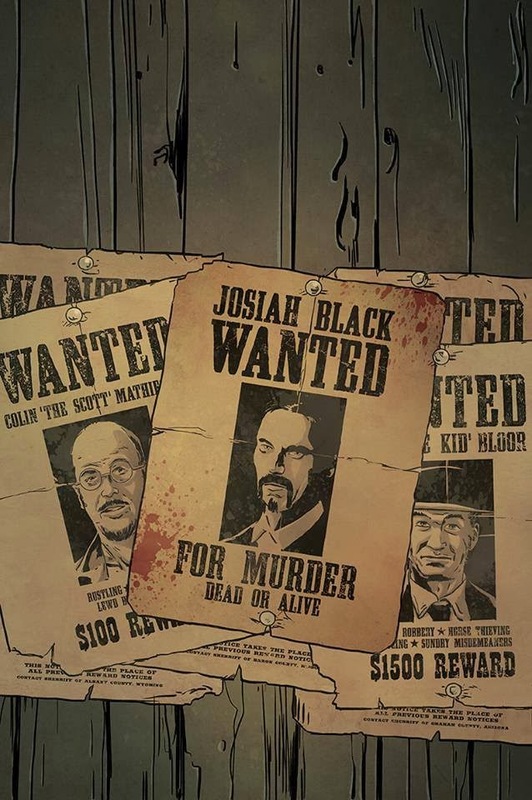 The fact that these could be likened to comic book splash pages struck me as I read the words hidden amongst the art. 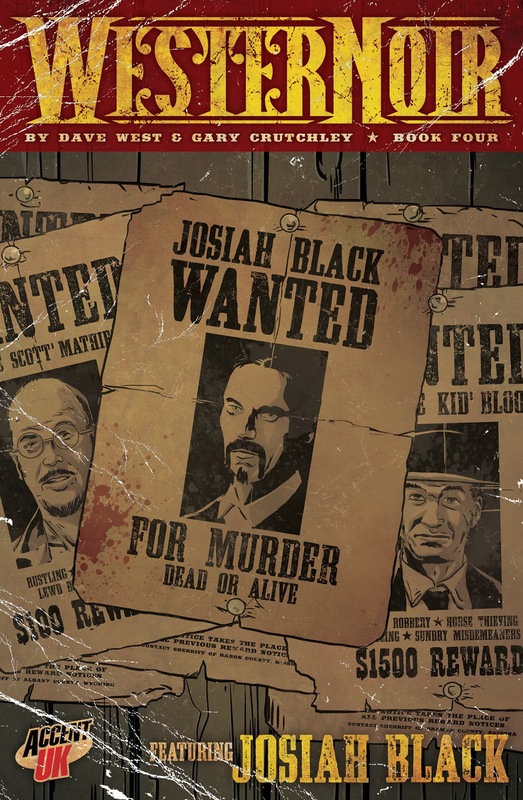 Also this week we had another great review for WesterNoir issue 3 over on www.brokenfrontier.com and issue 4 is now complete, checked and is ready for the printers. All on track for the launch at Maidstone's DemonCon7. And... I've finally completed greyscaling and lettering the Mite-D short story for From SuperZeroes to SuperHeroes, drawn by the talented Sebastian Velez. It's always difficult to know how well your comic books are doing once the boxes leave the house and are shipped around the globe through Diamond distribution. Every now and then I use an internet search to see if there are any reviews or comments. 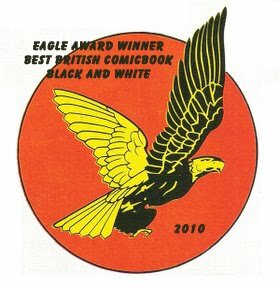 It's encouraging to come across an article that indicates that it's selling out at Diamond after only a week... http://investcomics.com/features/sold-out-new-1-and-2-comics-for-january-8-2014-release-week, but then again we didn't get a huge order when you compare it with any of the big companies so it's no surprise I guess. Haven't managed to find any recent reviews though, so I'm not sure what those people who have picked up a copy think of it. well, the cover looks awesome. Gary has produced another striking cover, beautifully coloured by the very talented Matt Soffe (and do pop over and check out Matt's work on his blog, you'll thank me), on top of which Andy Bloor has worked his magical design fingers to add the logo he designed for the book, the title(s) and that aged effect that works so well. 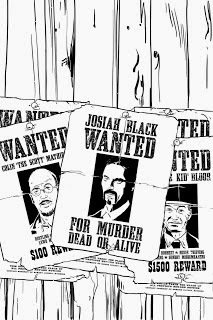 If you study the picture you'll spot a certain Colin Mathieson and also Andy Bloor on their own WANTED posters. You'll only get $100 for turning in Colin it seems, but Mr Bloor is worth a not inconsiderable $1500, I'll go get my sidearm. We intend to launch this issue at the upcoming DemonCon7 event in Maidstone, which will be our first Con of the year and also our first time at DemonCon. For those who don't know, DemonCon is a ''family friendly comic convention in the centre of Maidstone, Kent. With the new venue, Royal Star Arcade, proving to be a massive hit, this Demoncon promises to be the best yet, with more artists & writers and a number of big names. Amazingly talented guests, vendors, bar, cafe, traditional sweet shop, gaming and cosplay, what more could you ask for. An after show party I hear you ask....done''. See you all there on Sunday 16th February.